No other shop in London, if the world, has such a strong iconic association with design. Mention a 'Liberty print' and a clear image of the shapes, colours and textures involved immediately springs to mind. 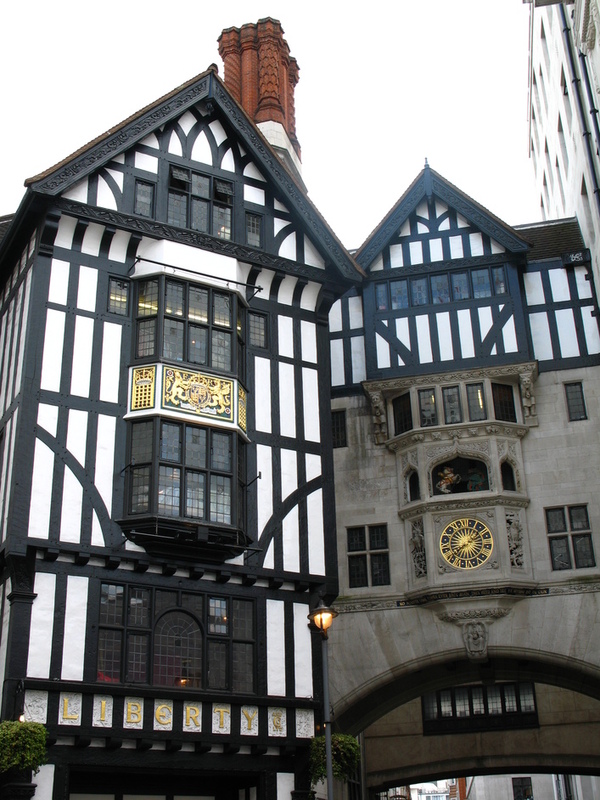 Housed in a striking, timber-framed, Tudor revival building on Regent Street, the powerful Liberty brand extends to the distinctive style of its surroundings. With small, intimate staircases, intricately designed elevators, wooden balconies and glass atriums this has to be one of the most aesthetically pleasing and unique department stores in the city. Just wandering around it particularly at Christmas time, when fairy lights adorn the ceiling is a real joy. Since it opened in 1875, Liberty has captured the hearts of shoppers around the world, finding fame and popularity in the 60s with designers like Mary Quant and Jean Muir producing the shop's own line in fabrics. Today, Liberty is home to fashion, beauty, childrenswear, accessories, homewares and has a Mini British Food Hall as well as Arthur's Restaurant on 2 - serving food, drink and all-day cocktails from brunch to early dinner. Come to covet the designer womenswear, ogle the arts, crafts and antiques or simply watch would-be fashion designers drooling over the textiles in the fabric department. Fabulous. Fabrics and fairy lights, balconies and beads, Mary Quant, Martin Margiela and Jean Muir. What are the best dining options near Liberty London London? Liberty London gyms, sporting activities, health & beauty and fitness. The best pubs near London Liberty London. Liberty London clubs, bars, cabaret nights, casinos and interesting nightlife. Where to have your meeting, conference, exhibition, private dining or training course near Liberty London. From cheap budget hotels to luxury 5 star suites see our discounts for Liberty London hotels, including The Courthouse Hotel from 93% off.